Join CJFE for a discussion about the state of mass surveillance in Canada, featuring a live Q&A with Edward Snowden. Whistleblower, former NSA contractor, and subject of the Oscar-winning documentary “Citizenfour,” Edward Snowden has sparked an international conversation on surveillance, privacy, and national security. But in the wake of the Snowden leaks, what have we learned? Where are we headed? And what questions remain? Moderated by Anna Maria Tremonti, Host of CBC Radio’s The Current and CJFE Board member, Snowden will be answering questions from individuals in attendance, and submitted in advance via Twitter. 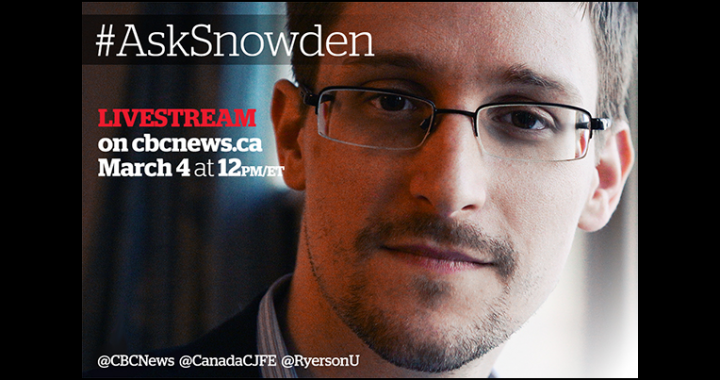 Canadians can submit their questions for Edward Snowden using #AskSnowden on Twitter. The event will be live streamed at CBCNews.ca. Also to be launched at the event: a tool for accessing information about government surveillance, created by (former) iSchool archives students in partnership with the Canadian Journalists for Free Expression. Following the Q&A with Snowden, the event will feature a panel discussion with Canadian experts discussing the implications of these revelations for the country, and the future of digital surveillance in Canada.